This text provides an accessible historical progression through the attempting to draw out more general issues and implications. The discussion of key figures such as Picasso, Matisse, Pollock and Warhol, and movements such as Cubism, Surrealism, Abstract Expressionism and Minimal Art is animated by the most relevant concerns of contemporary art historical scholarship. Issues of gender and ethnicity, criticism of the accepted canon of modern art, and important social and political influences upon the institutions of art are interwoven with the discussion of particular works. Since the end of the 19th century Modernism has been the dominant force in the production of western avant-garde art. It has, however, throughout the period been subject to a variety of conservative and radical challenges. Recently many of the values assumed by the modernist avant-garde have come under fundamental scrutiny. This collection of essays aims to equip its readers with the tools to understand these debates, and the wide range of artworks to which they have been attached. Modernist myths which have appeared to make art elitist or inaccessible, or simply irrelevant, are examined, as is Postmodernism, when the questions of whether we in the late-20th century are witness to the end of the modern period, and whether the diversity of contemporary art mirrors this situation are debated. 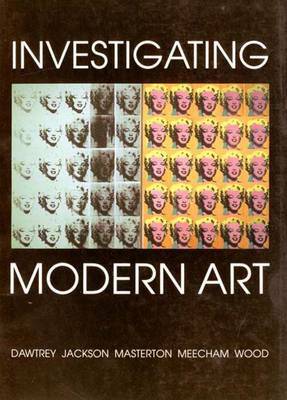 This book is part of a project funded by the Arts Council of England and the Open University, with support from the Tate Gallery and John Moores University, to meet the need for a greater critical understanding of 20th-century visual art and of recent developments in art practice. It is planned as an introductory text for teachers, gallery education staff and a wide range of students, and should provide a basis for critical discussion of modern artists, art movements and art works from a variety of viewpoints. Readers should find points to disagree with, and much to generate further debate and enquiry.